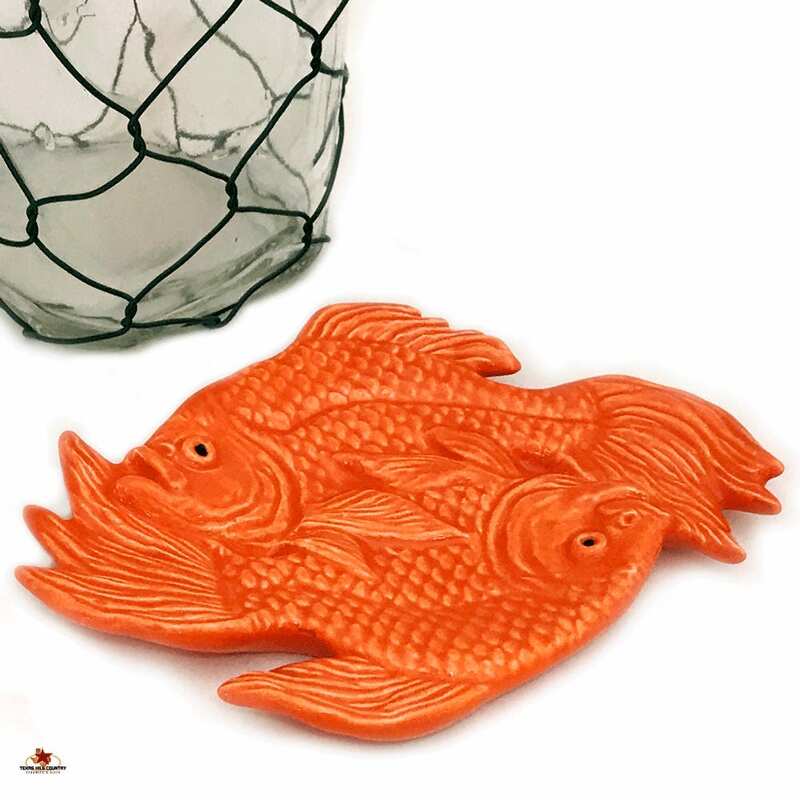 This exotic orange koi pond fish or goldfish personal size tea bag holder or small tray spoon rest is made of ceramic earthenware and finished in a bright orange glaze. 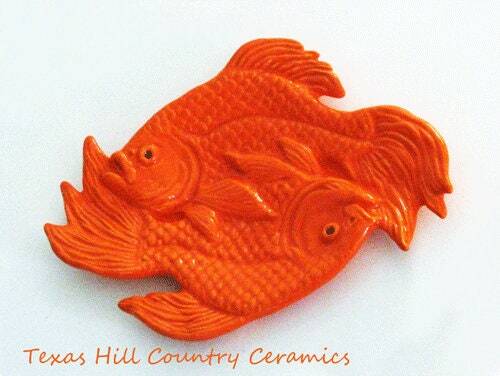 This ceramic goldfish can be used on a bath vanity as a soap dish or to hold rings and other pieces of jewelry. It may also be used in the kitchen for smaller spoons or to hold sponges, scrubby's, vegetable brushes. It may also be used at a dining table setting for condiments or small amounts of garnishes. • 1/2 of an inch high. Tea bag holder caddy's or spoon rests are fun to collect. 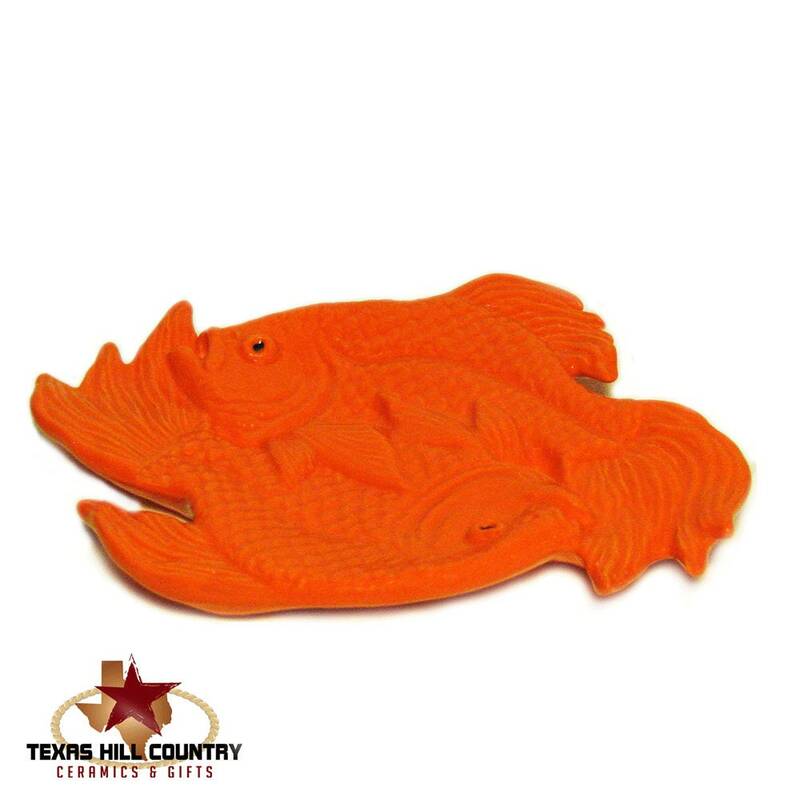 They can also be used as a cheerful decorative accent anywhere in the home or office. They are not limited to just holding tea bags, coffee pods or spoons. They can help keep track of your favorite jewelry, rings or earrings, keep a desk organized, or hold daily dog or cat treats, people candy, even hang on the wall or display case. Start your collection today - they also make wonderful gifts so keep some around for that last minute gift you may need. Coordinating nautical ~ aquatic items are available. All ceramics are made of earthenware clay in my studio located in central Texas, USA. Each piece is hand cast from a ceramic mold for uniformity and kiln fired. The detail of each individual piece is well defined, all glaze is lead free and food safe. Very nice handmade ceramic spoon rest that I use every day! The orange color matches my other kitchen accessories beautifully! I love it! Super fast shipping, excellent communication! Thank you! Perfect shade of orange. I've been having trouble finding this color as so many "oranges" are muted, light or a coral color. Using in "Koi" themed bathroom as soap dish. Love, Love, Love my little Koi!! So cute the way they wrap around each other. Darling for my kitchen. Another big hit by Jacque!! !